Audiobook production can feel like learning a foreign language. You’re either pumping out an audiobook every time you publish (as some indie authors like S.J. Scott do) or maybe you haven’t incorporated them as part of your overall book marketing strategy yet, because you’re unsure of the process and whether it’s worth the cost and effort. Folks, we’re here to tell you—you are missing out! The audiobook market is trending upwards, and we predict it will eventually become as lucrative as Kindle. The time to jump on board the audio train is now—before the market becomes too saturated. We understand why most authors don’t consider audio as a pressing concern, especially when there are a hundred other things to take care of when self-publishing. And we realize that marketing probably isn’t even a thought when you’re editing away on your manuscript, but we do urge you to at least consider this exciting opportunity. Audiobook creation can seem overwhelming, but when done right, you can easily have added yet another item to your author portfolio, which means another avenue for someone to find you! Why Should I turn my book into an audiobook? How can I turn any book into an audiobook? Can I Record the Audiobook myself? What equipment would I need? And many more commonly asked questions! Get comfy, grab a cuppa and let us be your guide on all things audiobooks. By the end, you’ll be able to decide if turning your book(s) into an audiobook is right for you. *If all of this just sounds like way too much work, we can handle all of the details and produce your audiobook for you. Our team has worked with authors like S.J. 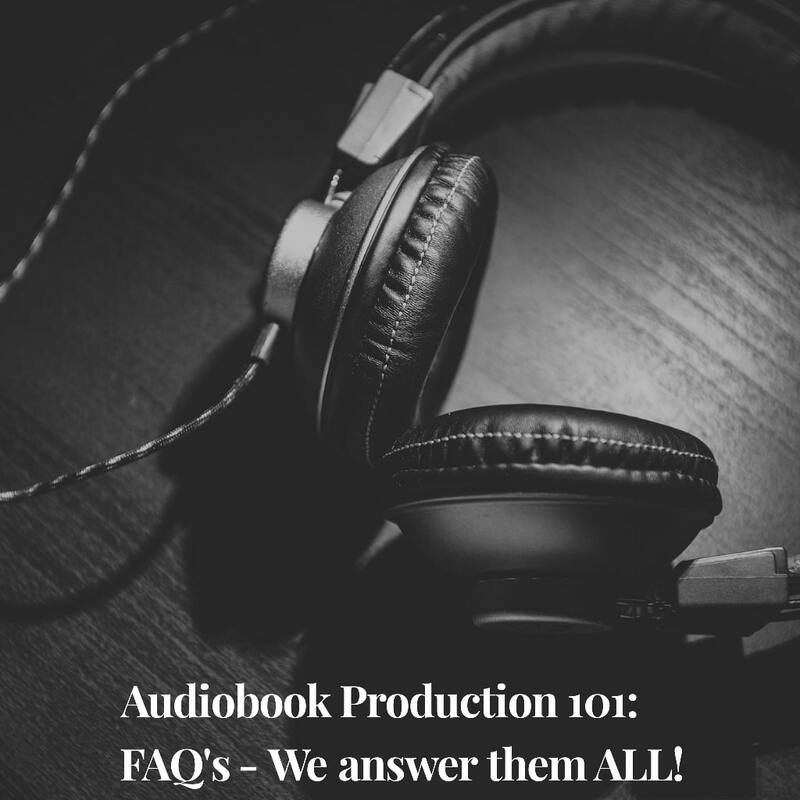 Scott and Akash Karia, companies like TCK Publishing, and more, to produce hundreds of audiobooks, and we’re happy to answer any questions you may have about the process. It adds another level of professionalism and quality to your work and shows that you are serious about your product. It gives potential fans one more avenue to find you by increasing your brand’s discoverability. Increased royalties: The audiobook market is far less saturated than Kindle or print editions. You can blaze a trail in the audiobook market now before everyone else jumps on the bandwagon. Read on to hear more about the process, but almost every author can benefit from getting an audiobook produced. Or you could enter a royalty-share agreement with a producer/narrator on a platform like Audible Creation Exchange (ACX). If you opt to commission production, you will have complete control over what you do with the audiobook. You can offer it for free or for sale on your website, give it away as a free incentive download (more on this later), or upload the files yourself to ACX and keep all royalties. If you find a royalty-share partner on ACX, you can effectively get an audiobook produced for free. However, you will split royalties with your narrator. This can be an effective way to add an audiobook to your catalogue without breaking the bank initially, but can place long term limits on your revenue if the book ends up doing very well. With this process, you do need to vet the narrators and also hope to find one that is willing to take a risk on your book sales. After all, it’s in their interest to partner on a top-seller, so if you have a niche book, you may need to sell your producer on its market viability. You also need to consider the overall production quality; both the voice acting and post-production side are important. Chances are your narrator will be adept at editing and mastering to standard, so in most cases you’re fine. But some may not be, so proceed mindfully. In the end, each direction has its pros and cons, and which one you choose will be based on your unique situation. Yes, you can record your own audiobook, but it’s not for the faint of heart. I’ve done it myself with some pretty basic equipment, but there was a steep learning curve involved. If you have the time and money to invest and plan to record more than one book, it might be a great money saver. Use a decent quality USB microphone like the ATR2100 and a pop filter. Find the quietest room in your home to record in. You can find ways to soundproof your office, but did you know that a closet is one of the best places to record? We know, your spouse might think you are a little wacko, but the final product will sound great because your clothes act as sound absorbers! Have your book in front of you on a portable device so as to minimize the sound of turning pages. If you view the book as PDF on your computer and have to scroll and click with a mouse, you risk recording those sounds. Go back through and edit and make sure the text matches the audiobook. Proof one final time, and then export your files to MP3 at 192 kbps. Find a version of your book that is live (print or digital) and then upload to ACX. ACX shares their audiobook specifications here. At Archangel Ink, we use and recommend these specifications for all audiobooks, so you can upload the book to ACX if you choose to do so. How much does it cost to produce an audiobook? If you produce the book yourself, the cost will be your time and the initial fee for equipment. The cool thing here is that after the initial cost and learning curve, you could eventually record audiobooks for other people too, along with your own future work! A common metric in audio production is cost Per Finished Hour (PFH). Experienced narrators commonly charge from $200 to $500+ PFH. So if your audiobook comes in at 2.5 hours in length, production cost may range from $500-$1250+. The other common metric (and what we use at Archangel Ink) is cost per word. At the time of publication, Archangel Ink charges 4¢ ($0.04 USD) per word. Depending on narration speed, that same 2.5 hour audiobook may fall in the range of 18-23k words, which comes out to about $720- $930 for a book of that length. Partnering with a royalty-share narrator on ACX will have no upfront costs, but you will be locked into a 50/50 royalty share deal for 7 years, and ACX will have exclusive distribution rights during that time. Getting an audiobook done for free can seem like a great deal, especially when investment capital is limited. But for maximum earning potential and distribution flexibility, consider commissioned production. How do I adjust my manuscript to be ready to record? This should be a given, but make sure the book has been professionally edited to ensure the highest quality final product. Be mindful of hyperlinks. External hyperlinks in your digital edition direct your reader elsewhere and you risk the possibility that they never finish your book. Plus, they are challenging to translate to print and audio format, so look for ways to minimize them. In this video, Rob shares his strategy on reducing the number of links in a book. If you have too many pictures and diagrams, consider making a companion guide to go along with the book. For example, if the text reads “see figure 2 below,” this obviously will not work in the audio version. Remove or adjust these items before you get too far into the process to avoid additional costs and time. Do a final read-through yourself first to make sure the that book makes sense when read aloud and then send it off. For other ideas, have a look at our in-house submission guidelines. Even if you don’t work with us, these tips can help to make your script audio-ready and make production more seamless. Where can I distribute my audiobook? ACX is the most common platform for audiobook distribution since it is an Amazon company, and distributes to Audible.com, Amazon.com and the iTunes store. This is where the lion’s share of audiobook sales occur these days. Findaway Voices is another great company offering non-exclusive availability in more than twenty markets, including libraries and educational institution channels across the world. Can I (Should I?) give away my audiobook for free? If you use ACX to distribute your audiobook, you will be able to request promo for giveaways and to help with finding reviewers. They’ll provide 25 promo codes each for the US and UK market for each audiobook that you publish. But note: they don’t send these automatically, contact them to acquire the codes. As long as you don’t have an ACX-exclusive arrangement, you can also make it available elsewhere for free. There is nothing inherently wrong with giving the book away for free, and it can actually be a very enticing lead magnet. Just remember: if you want to have complete control over distribution, you will need to commission its production and own the rights, rather than entering into a royalty-share arrangement with a producer. Am I allowed to make it available in bundles? The idea is: if you own the rights to multiple audiobooks in a similar genre, packaging books together to create a lengthier product is a great way to build your catalog and also to earn ACX bounties. Bounties are $75 bonuses awarded when a new Audible subscriber downloads your book first. Definitely worth considering. As a first time author, should I get an audiobook version of my book? The answer to this question is based on your level of comfort, experience, and of course, your budget. It can take a lot of work to get the book out there (especially if you go the DIY route) and it may not be worth doing it right away for your first book. We typically counsel new authors to wait and see how the book does, and then run a cost benefit analysis to determine the viability of creating an audiobook version. It’s not absolutely crucial to do it right away and you can always do a secondary launch to coincide with a later audio release. That said, if you have the budget, feel comfortable with the process, are highly organized, and already have an established following, then we say go for it! And with the recent uptick in audiobook market share, the odds may favor early adoption. Can I get an audiobook version live at the launch of my book? Great question. Yes you can. I’ll show you how, but it’s all about timing. I’ve said it over and over how timing is the #1 most difficult thing for authors who are self-publishing, and getting an audiobook version only adds to that challenge. Start recording your audiobook the moment your editing and proofreading is finished. Please note: it is crucial that your book is publish ready, no more changes or updates! Once you have a final version of your book, recording the audiobook (or getting it done for you) is your #1 priority. Get it edited, proofed, and a final version ready to be submitted to ACX (audiobook creation exchange) as quickly as you can. Unlike KDP which goes through a short review process and is live within 12 hours (normally), ACX can take between 3 and 4 weeks to process and make the book live. Have your paperback version live in order to submit. This means that in order for you to submit your audiobook version, there needs to be a book already out there that you can select during the upload process to ACX. This also means you need to wait until formatting is completed before you can submit the paperback version. Since we don’t recommend uploading the Kindle book early, this is the job of your print edition. Confusing I know, and this is where the timing gets tricky. This is yet another reason to plan your launch for at least 30 days after you receive final files, especially if you want different versions of your book available for purchase. Once your paperback edition is live, you can go ahead and submit your audiobook to ACX. It might be live before 30 days, but plan your launch accordingly to give it time to go through the review process. In the end, it comes down to timing and can be done with careful planning. Overall, creating your book into an audiobook is a good call for most authors in 2018 and the foreseeable future. We recommend choosing the best route for you based off your comfort level, budget, and expertise. Good luck as you venture forth into the audiobook world!